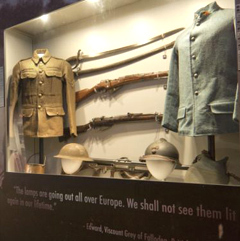 Uniforms and weapons on display in the World War I exhibit. A traveling exhibit from the World War I Museum in Kansas City will be available for viewing in Des Moines Friday. Spokesman Joe Godfrey says the rolling exhibit in a semi trailer is visiting 75 locations across the country. “It has several artifacts that are from the World War I Museum in Kansas City and it’s really just talking about kind of what the war was like,” Godfrey explains. Godfrey works for the Waddell and Reed investment firm that is sponsoring the traveling exhibit. He says the company’s founders, Chauncey Waddell and Cameron Reed, started the company after returning from the war and that’s part of why they are sponsoring the exhibit. He says the exhibit is a way to honor veterans and the founders of the company. 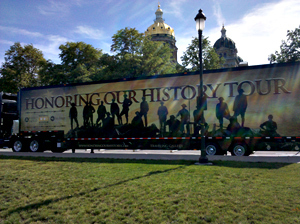 The truck carrying the exhibit will park in front of the Iowa capitol building. “It’s gonna be open this Friday the 22nd from nine until 4:30, the historical museum will be open at the same time. It’s free to get into the historical museum and it’s free to get in to view the big rig. And really what we’re trying to do is just give back and we’ve partnered with the historical museum, and although there is not cost, donations are appreciated,” Godfrey says. He says half the donations will go to the World War I Museum and half will go to the State Historical Society. Once you are done learning about the “war to end all wars,” you can also learn about the Civil War as the historical society is currently hosting an exhibit on Iowa’s role in that war. For more details about the World War I national tour, visit: www.honoringourhistory.com.